Warsaw, 30 April (ENI)–A leader in the Russian Orthodox Church has insisted his church has no wish to be an official State denomination and will never side with any single political force. “The threat that the church will be used by government doesn’t exist today,” said Metropolitan Hilarion Alfeyev, chairperson of the Moscow Patriarchate’s Department for External Church Relations, Russia’s Interfax news agency has reported. “Far from giving precedence to any political party or political power, the Russian church upholds the principle of equidistance. It cannot interfere in politics, support one party against another or identify itself with any political power,” said Hilarion, speaking at a Moscow meeting with young Orthodox Christians, on 21 April. However, the church also counted on the State to reciprocate by not interfering in church affairs, he stated. 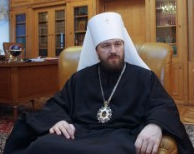 Hilarion said the church’s stance had been enshrined in the Russian Orthodox Church’s “Social Doctrine Foundations,” adopted by its Synod of Bishops in August 2000. Russia’s predominant Orthodox church has in the past faced criticism for links with State institutions, as well as with Prime Minister Vladimir Putin’s United Russia party, which has 315 seats out of 400, in the State Duma, the national legislature. At a separate meeting in Moscow earlier in April, Metropolitan Hilarion called on Orthodox theology students to do more to learn foreign languages in order to promote their church’s culture and spirituality abroad. “The task of future priests is to witness to Orthodoxy, correctly and accurately, passing on information to a great variety of peoples,” said the metropolitan. Hilarion is a fluent English speaker, who holds university doctorates from Oxford and Paris, and served previously as an assistant bishop in Britain in 2002 and as his church’s representative to European institutions. “It’s important that clerics who work and represent our church abroad should know the local language, as well as having a mastery of English,” he stated. Now all that’s needed to make this real is the Patriarch to issue a press release saying the same thing. Externally, the message Met. Hilarion voices is broadly well recieved. The question is, how much has this message been advertised internally? Even if most sincere, a Metropolitan for ‘external affairs’ voicing a policy regarding a very ‘internal’ attitude has to be echoed by the Patriarch and regional choices, lest it be more ‘helpful politically’ than ‘actually true’, as it were. Plenty of articles are available by Forbes and other serious journalistic outlets demonstrating between the Russian Patriarch and Vladmir Putin a closer relationship than US Pres. Obama and VP Joe Biden. Every time I hear a ‘subordinate hierarch’ say something impressive and growth oriented I can’t help but think of the times I’ve felt like ‘Charlie Brown’ all excited and trusting, then running up to ‘kick the football’ held by ‘Lucy’, who at the last moment lifts the ball away just as Charlie swings his leg to kick it. Charlie does this time and time again because he wants to believe it is different this time. What I’ve come to worry about is that apparently not even a (who came up with this word?) ‘primate’ can’t really make a promise either. Well, at least can’t make a promise to those within the church in democractic societies with laws forged by the Latins having to do with ‘heirarchical churches’. Churches can make promises to those outside the courts will enforce, and in ‘congregational’ churches to some degree inside as well. But in our more or less essentially ‘federalist’ Orthodox church, there is not yet a path the courts have matured to recognize. What to do? Maybe that’s why there’s a ‘leadership 100’ in the USA. Someone recognized that there is no point in giving money to people who are, essentilly, ‘legally incapable’ of keeping any promise. Have I got any of this wrong? I sort of hope so but I think precident supports it. Harry, that’s an interesting point. I never thought of Leadership 100 as a way for people to give to the Church but “not give” to the national HQ. Let us explore this. There is a tendency among people to want to be charitable to the Church, to want to be grateful in some way to God for His many blessings. I’m not sure that Leadership 100 will ultimately succeed if it is considered to be a para-church or philanthropy (like the Salvation Army, Habitat for Humanity), that is an avenue for giving for the wealthy because in some inchoate way they know that the centralized hierarchy is not doing the business of the Church. Why? Ultimately we have to ask: what is the purpose of “X”? It is more than just asking, “where does the money go?” Is it used to bail out the Archdiocese because its deficit is critical for the present fiscal year (probably because of litigation)? Or is it going to Alexandria, Istanbul, Jerusalem because these are essentially moribund churches that exist in name only? If on the other hand Leadership 100 can be turned into a foundation that provides seed money to the parishes for the implementation of local ministries, like medical clinics, soup kitchens, etc., then I think it can be a blessing and its coffers will never run dry. Perhaps it can grant monies on a 1:1 basis for such endeavors. Let’s say that they will provide $5K a month for the establishment of a soup kitchen if a local parish likewise provides $5K per montth. How can an answer about about where money goes be trusted? No promise can be made by hierarch in a hierirachical system to anybody in the church that is subjet to verification and inspection, much less sanction for misdoing. They could change their mind after they advertise they want money and collect it and before it is spent. Perhaps really the right answer is that giving money to the church should be understood as nothing more than the personal disposable income of whoever’s fingers it passes through along the way. Giving more than their personal salary need is a mistake for a Christian when so many other charitable organizations do such a better job accounting for spending and keeping administrative costs low and known. When I see unmarried clergy paying themselves more than married clergy with families, well, it’s like the wake up call you get when history demonstrates two ‘Orthodox Countries’ having a war between them. What’s an Orthdox priest supposed to do, pray for victory over the troops of the other Orthodox country? Harry, I can’t disagree with your point at all. I was just thinking generally. Personally, I’ve often said that the Church needs to be re-constructed according to political/municipal lines, with bishops being as close –and accountable–to the people as possible. I’m not only thinking one bishop/city, but perhaps no more than 12 parishes/diocese. And for dioceses to be incorporated as legal corporations with the bishop as chairman of the board. If there was some sense of local/regional money doing local/regional things and no money ‘sent out elsewhere’ without that being the intention of the donors then I think you’ll see donations skyrocket. Harry, I sense no essential disagreement. To answer your question specifically, the first thing that has to happen is for an Orthodox church to be granted autocephaly. Let’s be honest, as long as unaccountable archbishops in NYC “preside” over “eparchial synods” then we can be sure that the foreign overlords continue getting their cut from the top. I posted the interfax mini-article on these comments under comment 6 in “Metropolitan Hilarion visits Italy” in response to some criticism of the relationship between the ROC and the Russian government. Of course, words are not only cheap but subject to definition. What really matters is what the various actors consider “interference” in the state or in the church by the other side. This is highly unlikely to look like the relationship between the US gov’t and the various churches here in America. It seems to me that the relationship between the Russian governement and the ROC should be seen in the greater context of the Russian government’s attitude toward the major religions of the Federation. Russians tend to see their country as a mosiac rather than a melting pot. They value each religious culture but see each as separate entities, sometimes as regional entities. The ROC will enjoy a preeminent role since it is the largest religious organization in the Federation and since it is so closely tied with Russianness. Much of Russian culture and Russian Orthodoxy have proceeded hand in hand and before the Revolution they would have been thought to be inseparable. The government is facilitating the teaching of Orthodoxy in schools in regions where it predominates. Judaism in the Jewish oblast. (Moderate) Islam in the Islamic regions, etc. The notion of separation of church and state does not resound well in Russia. “Separation of Church and State” was a slogan of the communists who actually meant by it the suppression of religion. Here in America, the term actually amounts to an effort to cleanse the public realm of religion in general or, more intensely, Christianity specifically. The concept actually got read into our constitution beginning only in the 1940’s. Before that the Establishment Clause really only meant that the federal government (not the state) could not designate one church as the national church, give money exclusively to that church, pay its clergy’s salaries, and make public office dependent on good standing in this national church. That’s what “establishment of religion” meant to the founding fathers and in the British culture from which America emerged. In legal parlance, a phrase like “establishment of religion” is referred to as a “term of art” i.e., a phrase created to bear a specific meaning. It’s meaning is not defined by the impression that anyone might get from reading the three words together but rather from the usage of the phrase in English legal parlance. So we should expect to see the Russian state favor Orthodoxy but also aid other large religious populations within the Federation. “Interfere” has a much graver connotation, and thus meaning, when it is used in the Russian context of the suppression and corruption of the Church under the Bolsheviks as well as reducing the Church to a department of state under Peter the Great and thereafter. A certain amount of mutual (though non-partisan) cooperation between the Church and the government (whoever leads it) is probably not excluded. Fr. Patrick Henry Reardon, Orthodoxy and Civic Duty.